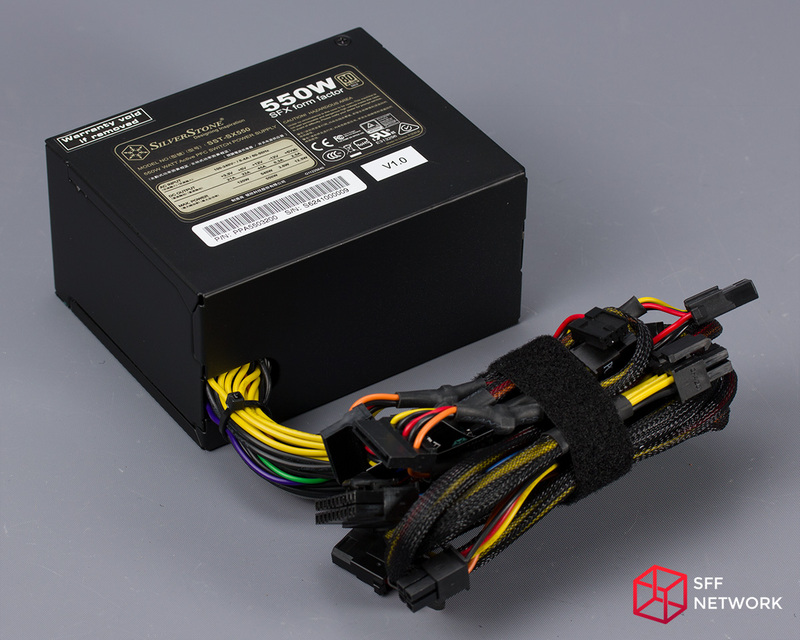 On the bench today is the SilverStone SX550, a 550W SFX power supply with Gold-rated efficiency, 80mm fan, and fully hard-wired cables. An interesting unit that slots in between the more budget units like the Bronze-rated ST30SF V2.0 and ST45SF V3.0 that I reviewed recently and the higher-end modular units in SilverStone’s ever-growing line of SFX and SFX-L PSUs. 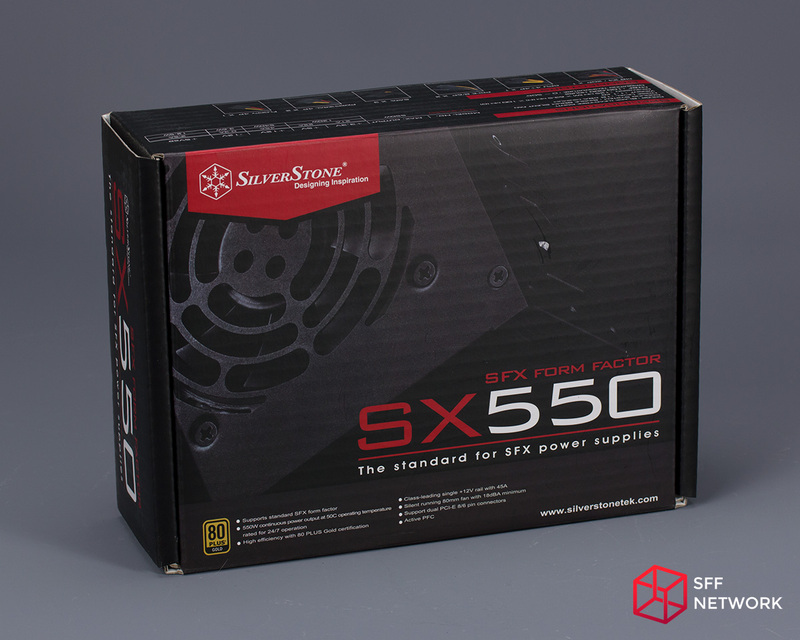 It’s a little thing, but I’m really liking how the packaging on SilverStone’s newer SFF power supplies look. On the other hand, while the picture looks classy, it does hide that this unit is not actually modular at all. The back repeats the marketing on the front in several languages. Also present are two tables, showing the efficiency and fan curve. The marketing copy claims “low noise” but the graph implies otherwise, with a minimum fan speed of around 1500 RPM and a maximum of 3500 RPM. On the top of the box is some more specifications, load table, and the list of connectors. Of note is that the 12V is capable of outputting almost the entire rated wattage alone. Though maybe it’s not really worth noting anymore, considering that every PSU I’ve reviewed so far uses DC-DC conversion and can do the full wattage on just the 12V. Funnily enough, the SX550 ships in a much smaller (SFF!) box than the cheaper ST30SF V2.0 and ST45SF V3.0 units. 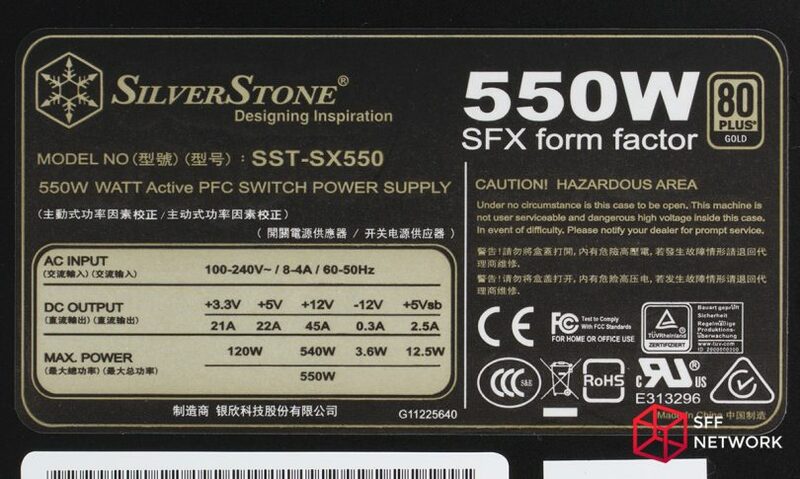 As expected for a SilverStone PSU, there is the model-specific manual and the general SilverStone power supply documentation. Otherwise the bundled accessories is pretty minimal, with the power cord, a few zip ties, and two sets of mounting screws (regular and thumbscrew). Distinctly missing is a SFX to ATX adapter bracket. SilverStone told us at CES this year that all new models will not come with one. This reduces the price for those using the SFX and SFX-L units as intended. and those needing the adapter can buy the reasonably priced PP08 or equivalent. I’ve noticed that SilverStone basically sticks to these lengths for all their SFF units. and like most of those, I don’t have any complaints about the length of the cables here. 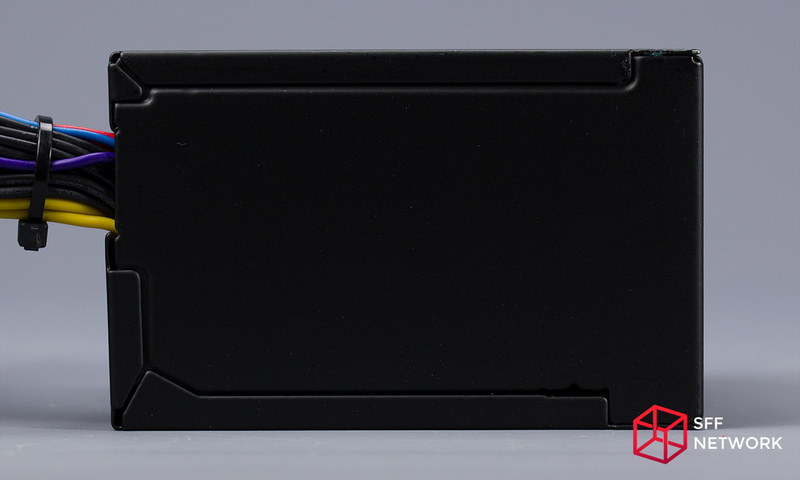 The connector selection is appropriate for the most part, though I always would prefer to see the floppy power connector split off into an adapter instead of being hard-wired. I also would have liked to see an additional SATA connector, maybe where the floppy connector is now, for connecting an optical drive that is located away from the storage drives, or the like. The exterior of the SilverStone SX550 is a minimal affair. And while it’s only a 80mm, I like that the fan is mostly centered on the top, unlike the strong offset used on the SX600-G. 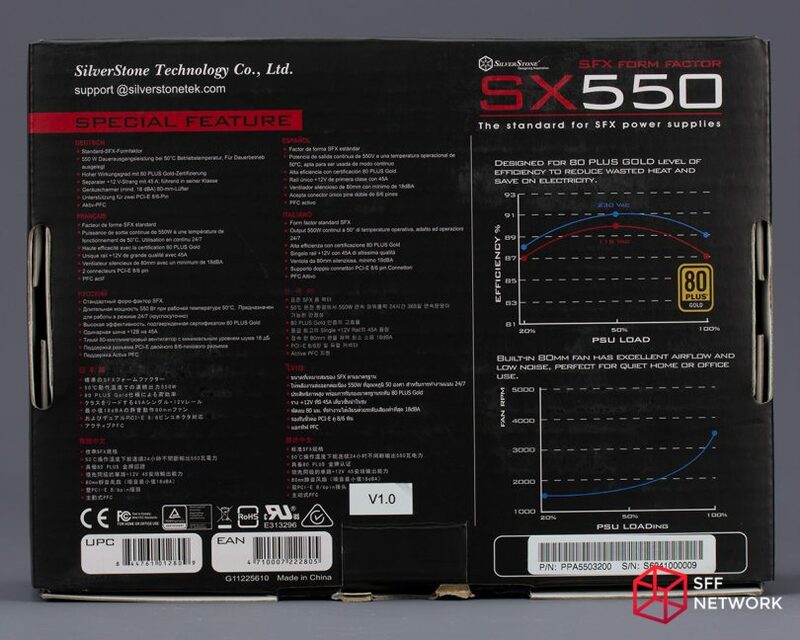 The SX550 (including cables) weighs 1.08kg (2.33 lbs). On this side we find… nothing, except for some vents that are strangely almost entirely blocked off. Over on the opposite side is nada also. The rear of the SX550 is well vented, with the honeycomb pattern covering most of the surface. 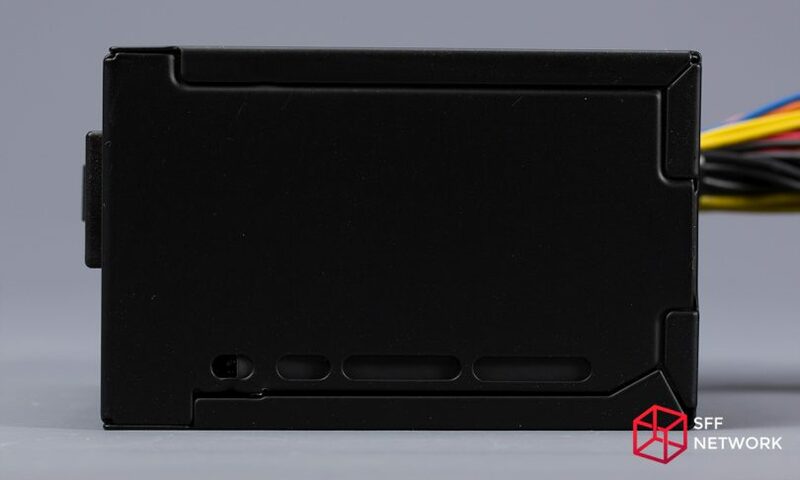 The corners of the PCB are inset fairly deeply and there is a plastic shield as well, so there should not be any issue with the mounting screws on this unit. The term “non-modular” probably conjures images of ATX cable nightmares that could potentially strangle you in your sleep. 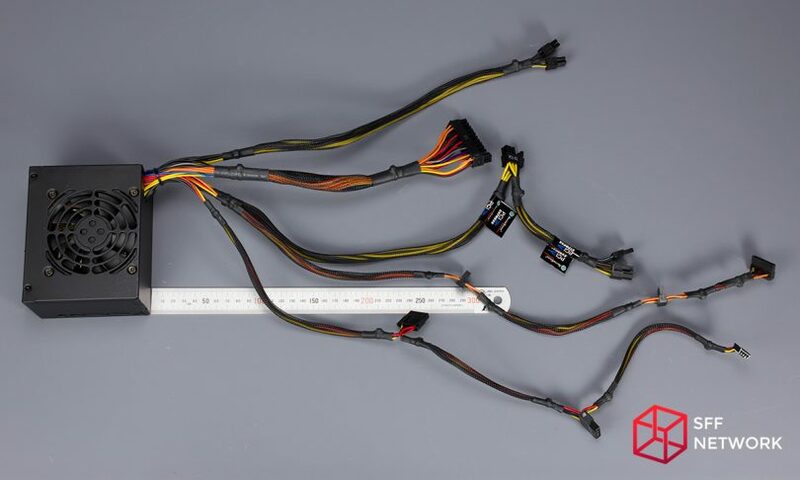 But with the combination of fewer wires and shorter lengths, the wire harness on the SX550 is very manageable. Speaking of the cables, there isn’t the typical plastic or rubber grommet where the wire harness exits the metal housing. Instead, the edges of the hole have been rolled over, which accomplishes the same result of keeping the metal housing from cutting into the wires without requiring an extra part on the BOM. Unlike the location, the contents of the label contain no surprises. 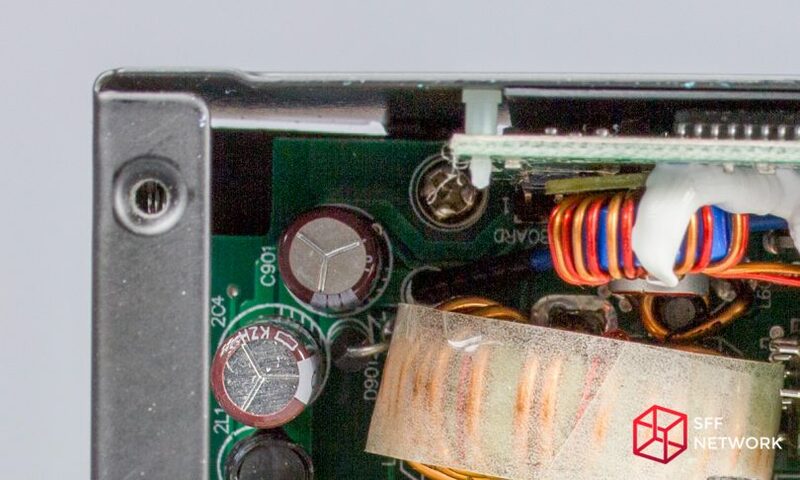 Even though this is a more expensive power supply, the SX550 only features a 80mm fan instead of a 92mm like the ST30SF V2.0 and ST45SF V3.0, and not only that, but the fan vent is stamped instead of a wire grill. 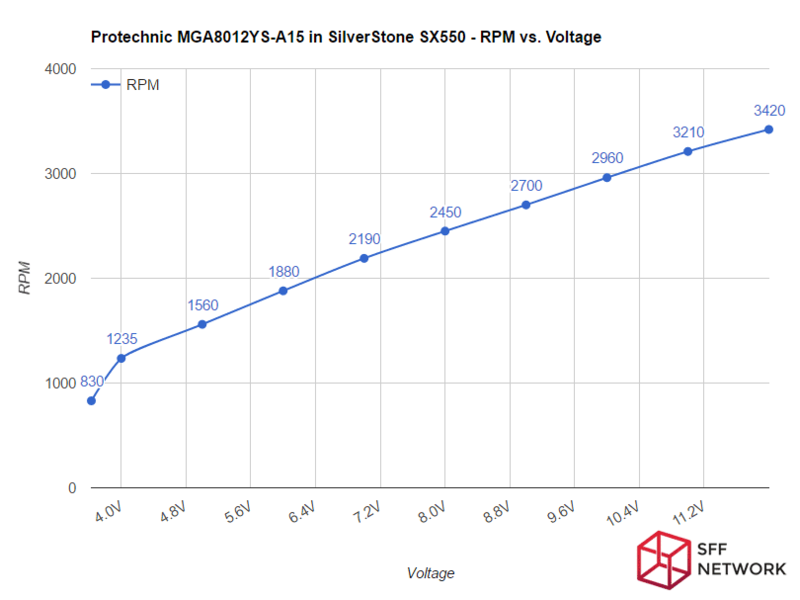 As mentioned at the beginning of the review, we currently lack the expertise and equipment to properly evaluate the electrical performance of power supplies to a complete extent, so the following data is more to demonstrate that the SilverStone SX550 is capable of powering the test system. I used various splitters and adapters to connect the 2x 6+2pin connectors from the SX550 to the 2x 8-pin and 2x 6-pin required to power the dual MSI 280X Gaming cards. This is absolutely NOT recommended, because it’s getting very close to the max rated amperage for the wiring and terminals. The SilverStone SX550 powered my test setup with no issues up through Test 4. However, it was not stable at all on Test 5 with both Radeon 280X’s under load. On the first attempt, the system went four minutes before suddenly restarting. Upon restarting, the motherboard complained about a power surge. After 2-3 more attempts with the same results after a few minutes, the system would began to immediately reboot upon starting FurMark with CrossFire enabled. While 45A on the single 12V rail is just enough in theory, this kind of setup is right on the edge. In addition to that, running two 280X’s on the single PCIe strand is very much beyond the manufacturer’s specs. So the inability of the SX550 to successfully complete Test 5 should not be taken as a knock against the unit, I’m just mentioning this for completeness. 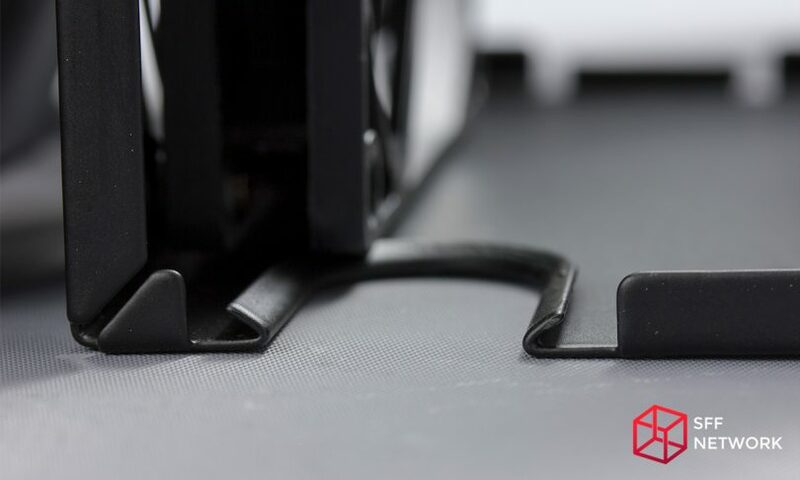 The blades on the SX550’s 80mm are fairly thick with narrow spacing between, usually indicative of a fan designed for better static pressure performance. Note that the silver rectangle on the bottom blade is a piece of reflector tape for the non-contact tachometer. 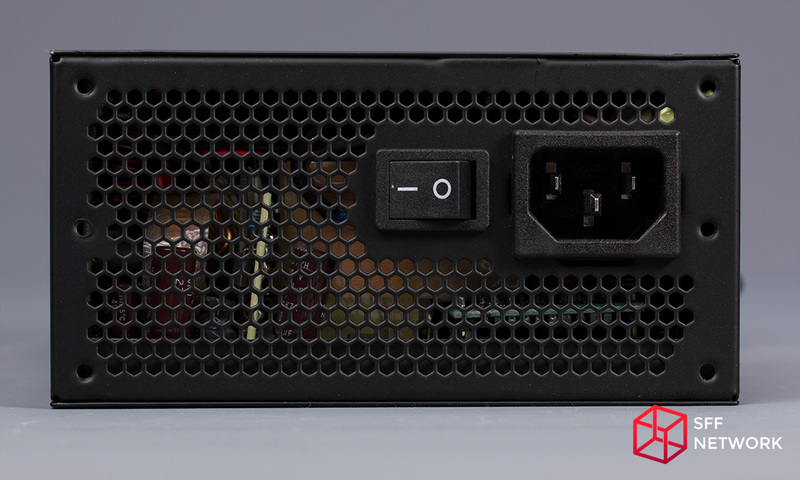 A departure from the Globe Fan’s typically seen in SilverStone SFF units, today we’re looking at a Protechnic Electric MGA8012YS-A15. It is rated at 12V and 0.28A, and looks to feature a sleeve bearing if this fan follows Protechnic’s normal model naming convention. As seems to always be the case with these PSU fans, there is no spec sheet available online though. 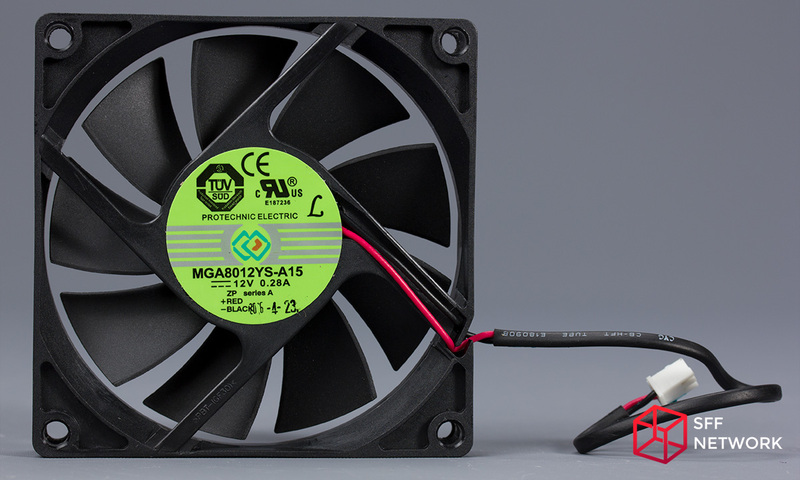 The fan starts at 3.63V and from there increases fairly linearly from 1235 RPM at 4.0V up to 3420 RPM at 12.0V. There’s not much to say here, it’s a simple temperature-based controller. 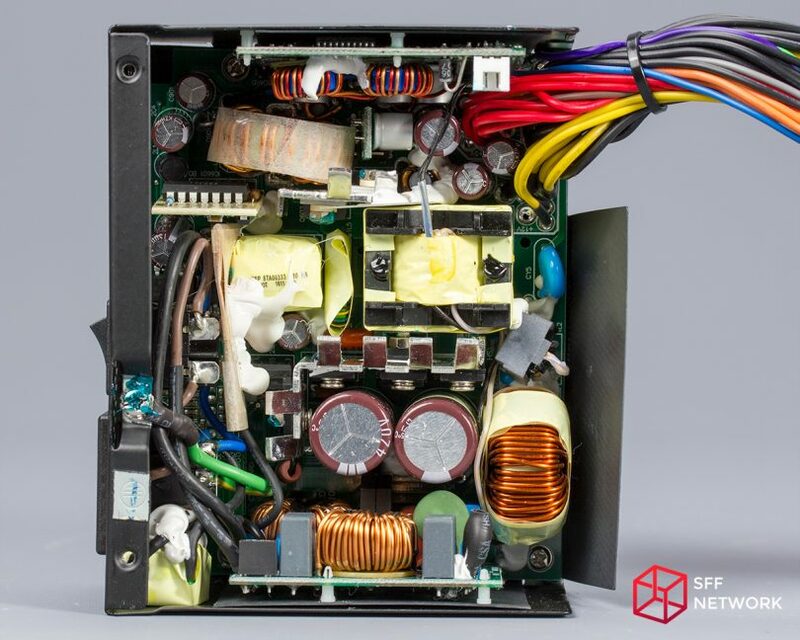 The SX550 features a good range of protections: Over Current, Over Power, Over Voltage, Short Circuit, and Over Temperature. It is lacking Under Voltage Protection though. I tried to trip OTP by running the PSU at load and pointing a blow dryer at the intake to dramatically increase the internal temperatures. Alas I didn’t get a clean, OTP triggered, shutdown doing this, instead the system restarted and I got the same power surge warning from the motherboard as when I tried to load both 280X’s. The SX550 is in a strange place when it comes to fan noise. The 300W and 450W entry-level SFX units from SilverStone are lower efficiency (Bronze vs Gold) and lower wattage (obviously), yet the most recent revisions of those two units are actually quieter at low to medium loads, in part due to their larger 92mm fans. This is most noticeable with the ST30SF V2.0, on which I measured its fan around 800 RPM in the 50-150W load range, while the SX550’s fan was spinning at almost 1500 RPM around the same wattages. So that means the SX550 is almost twice the wattage and more efficient, yet it’s fan is going almost twice as fast as the cheaper ST30SF V2.0 at everyday load levels! Not to mention the original ST30SF, which will be sold alongside the V2.0, and features a semi-fanless design. Luckily, while the SX550’s fan does have some bearing noise, it’s nothing serious and there is no annoying tonality or whine. 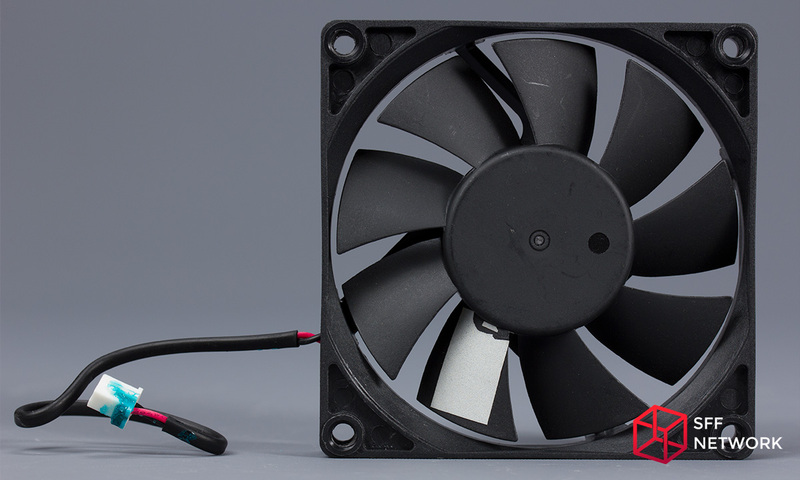 But there’s no denying that a 80mm fan spinning at 1500 RPM is indeed very, very noticeable in a quiet room, and even in a noisier office environment it’s audible when running in an open-air setup. 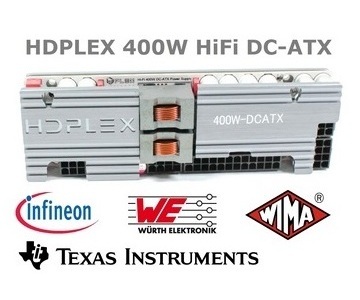 So for silence enthusiasts (like myself), HTPC users, audio engineers, and so on, this is not the PSU for you. For a different perspective though, I asked SilverStone about why the more expensive unit has a smaller fan, and apparently the SX550 is aimed more at SilverStone’s system integrator customers (companies like Falcon Northwest and Maingear PC). 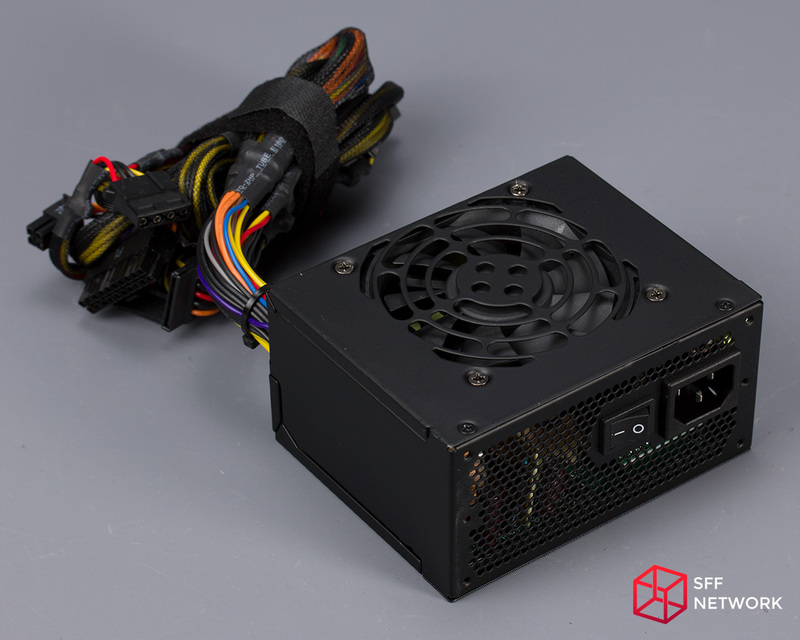 The system integrators, and by extension their customers, have not requested a larger fan yet, so I suppose not every PSU has to be built to achieve the lowest noise levels practical to be commercially successful. But with a little bit of rearranging, there is easily room internally for a 92mm fan, so maybe we’ll see a V2.0 of the SX550 at some point. I don’t have much to say about the internals. It’s hard to tell from this angle, but as I mentioned earlier, with some slight changes there would be room for a 92mm fan. All the electrolytic capacitors are from Nippon Chemi-con/United Chemi-con (a subsidiary) and are rated for 105°C. 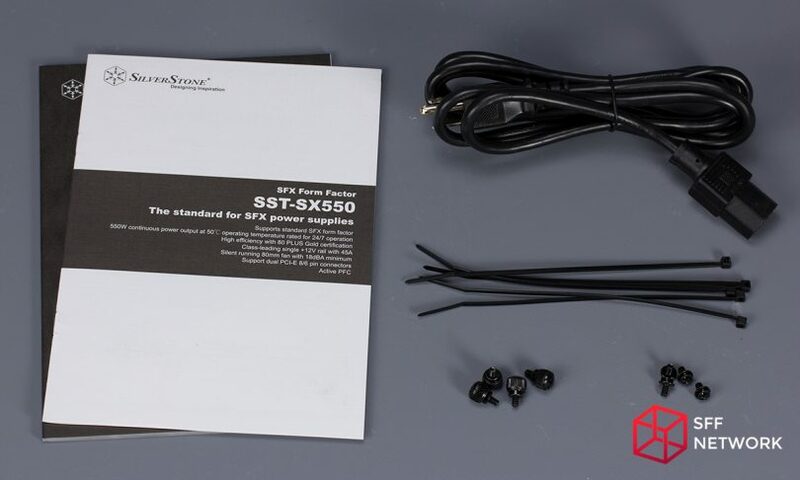 From talking with SilverStone, the SX550 was originally developed mostly for their system integrator customers and for that market this unit makes perfect sense. The 550W rated wattage and Gold-rated efficiency makes for good marketing points, and the lack of modularity doesn’t matter since the end customers won’t be the one assembling the computer. And coming in at $95.99, the SX550 saves those system builders a bit of money compared to the higher-end (and more expensive) modular SFX and SFX-L units like the SX600-G, SX700-LPT, etc. But for the retail market, it’s a bit of a tough sale though. For those with HTPC and/or light gaming builds who don’t need the extra wattage, then the ST30SF V2.0 ($50) and ST45SF V3.0 ($60) are both cheaper and quieter. So strangely, in this instance, getting a PSU that’s more efficient and overkill in wattage would actually be louder. 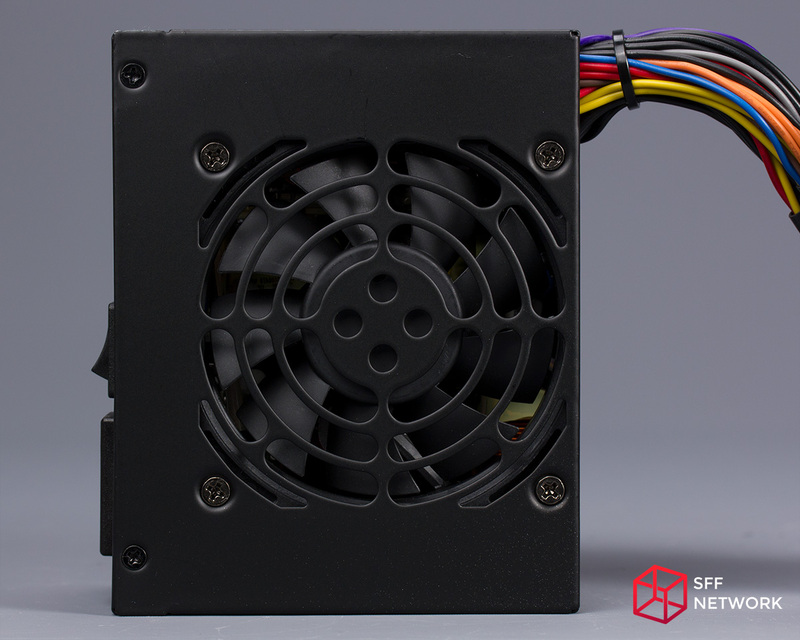 For higher-end gaming rigs that do need a 500W+ power supply, then spending just $24 more for the Corsair SF600 nets you semi-fanless functionality, full modularity, high-quality 92mm fan, and a 7-year warranty. Granted, $26 is not a trivial price difference, but a modern SFF build that actually requires 500 Watts of power is presumably a pretty high-end and expensive rig anyway. 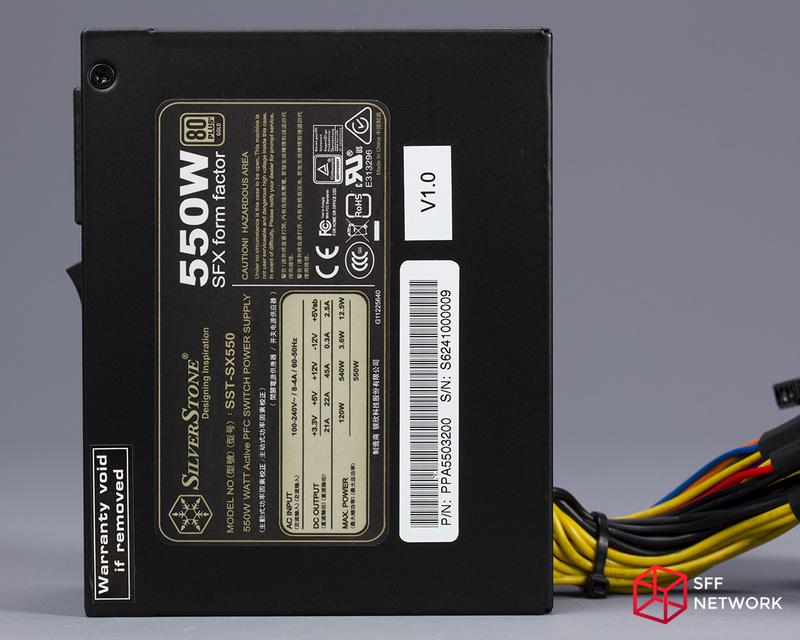 But for those who need a 550W SFX power supply with just two PCIe connectors, aren’t too picky about the cables or noise, and are on a budget, then the SilverStone SX550 looks to be a solid choice. Thoughts? Discuss them in the forum here. Review sample provided by SilverStone.